When I was 21 years old I worked for Elle South Africa. I always knew I wanted to work for a magazine and from a young age I’ve had an interest in fashion so it was serendipitous that I was first hired as the magazine’s designer. I loved working for ELLE, I had amazing role models in women who were (and still are) intelligent, hard working, passionate and not only thought fashion was fabulous but that it was important to publish thought provoking articles on the world around us. It makes me extra proud that when I picked up the French edition of this week’s ELLE I can say that I was once part of this family. 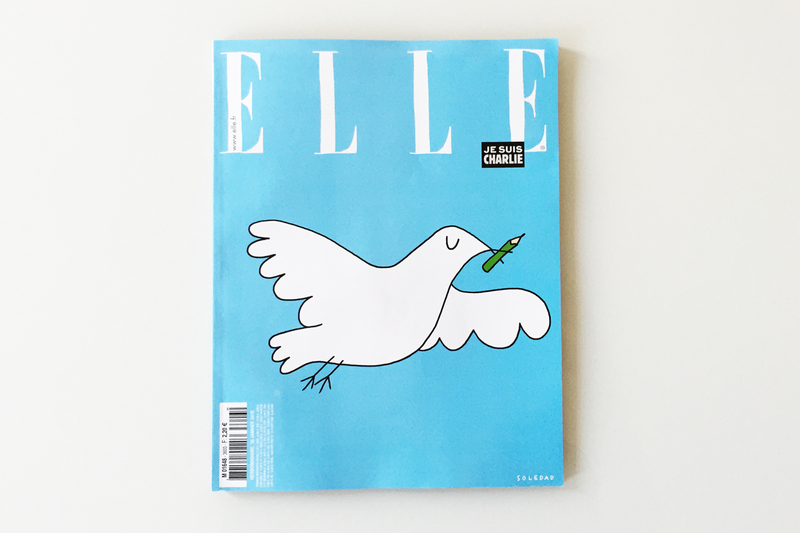 Their beautifully illustrated cover, by well-known Soledad, that conveys the sentiment of what we all want – peace. 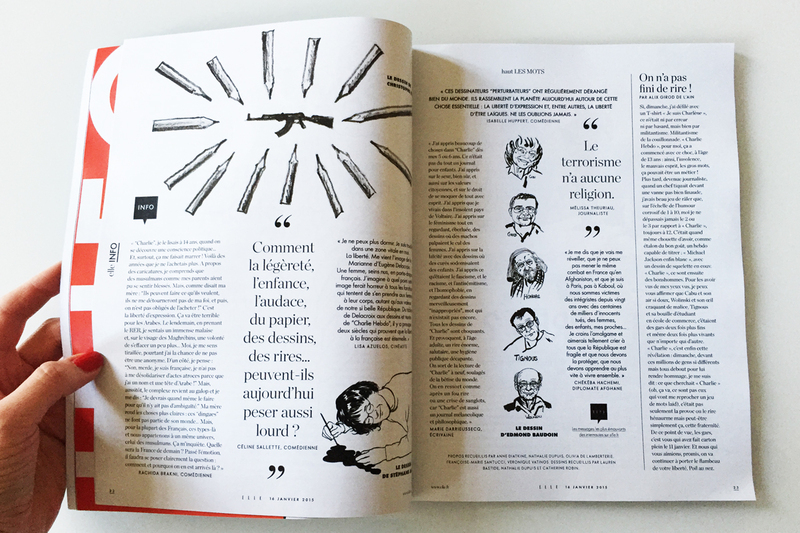 The magazine has run 13 pages on last week’s killings in a very profound and sensitive way. 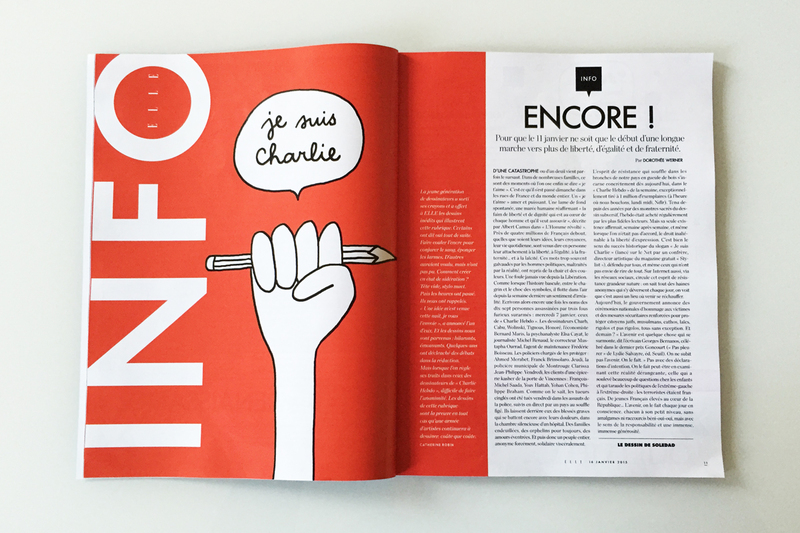 They list the names of all the people who were killed, commissioned young cartoonists to draw, published opinion pieces and articles from well-known actors and writers as well as quotes from young children on what they’ve heard and their thoughts on the tragedies. 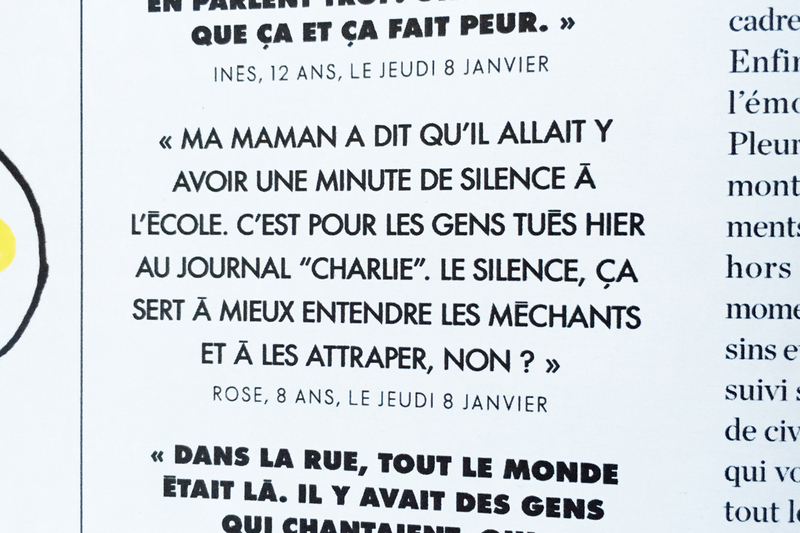 The quote above reads, “My mom said that we would have a minute of silence at school. It’s for the people who were killed yesterday at the newspaper “Charlie“. The silence, is for us to better hear the bad guys better and to catch them, right?” And, for me, the saddest and most profound piece is written by the massacred cartoonist Wolinski’s daughter, Elsa. It’s awesome that a fashion magazine like ELLE, in amongst pages filled with fashion trends, shopping tips and make-up products, can run such a beautiful homage to an awful tragedy. I hope that wherever you are in the world your local ELLE edition will run the same content. Bravo ELLE! Hi Sam. What a wonderful,well written blog you have here! And it was lovely to read about your time at Elle… Those formative years feel so distant, but I’m really glad to have shared them with such an inspired woman.